Versatility and functionality. The EZ-lift air mechanism moves your sewing machine like an elevator up and down via pressurized air to help you sew in any position. 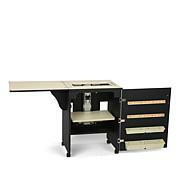 The functional shutter door lets you conceal your sewing machine and has 2 trays of storage for accessories. 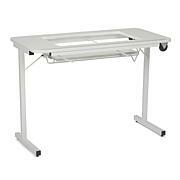 Use the fold-out leaf as an additional workspace, which is supported by snag-free hinges and tons of practicality. 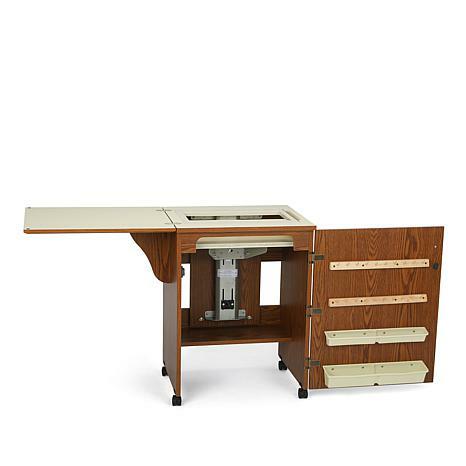 Broaden your sewing experience with this nifty cabinet. 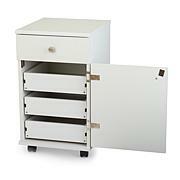 People have complained about putting this cabinet together. The problem was that the pages were not in order. Once we figured that out, it was a breeze assembling. 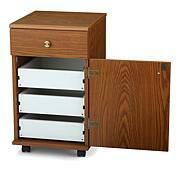 This cabinet fits my Futura better than the cabinet I had made for the Futura. It will fit any standard machine and the style looks great. Plus I had a free shipping coupon which made it even nicer.